gio Scolari was born in Casalbuttano (Cremona) in 1952. He works as a Master Violin Maker in Cremona. He studied at the International School of Violin-Making in Cremona under the guidance of Masters Pietro Sgarabotto and Gio Batta Morassi. From his graduation in 1970 until 1976, Giorgio Scolari worked in the studio of Master Morassi, later he set up his own workshop. At present he works together with his brother Daniele. Since 1973 he has been a teacher of practical violin-making workshop at the School, where he also fills the role of Assistant Headmaster. He studied organ, piano and composition and is intensely involved as the director of various choir groups. He taught numerous students who are now working all around the world, and some of them have by now become world-famous violin-makers. 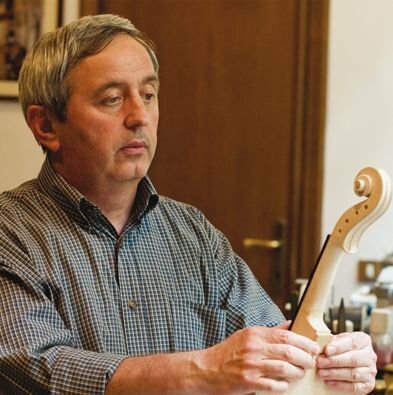 He has gained various professional positions, among which: Coordinator of the Professional Training Courses jointly initiated by the State and Region; Coordinator of the Internship in various violin-making workshops in Cremona; President of the Violin-Makers' Group "Confartigianato" in the Cremona Province, and President of the "A. Stradivari" Violin-Makers' Consortium of Cremona.